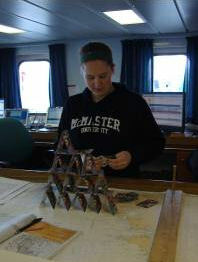 Day 20 was spent enjoying St. Anthony and getting ready for the main push of survey which will begin tomorrow. 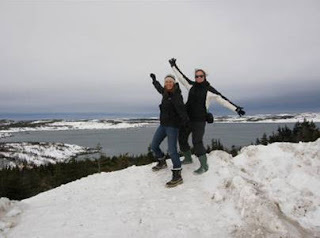 Graduate students Livia Goodbrand and Laura Wheeland went for a hike in the nearby hills, and seem to have conquered at least one. Back inside the Celtic Explorer, quite refreshed, Laura decided to show everyone what she had learned at McMaster University during her BSc degree. Down in the bowels of the ship, the day shift went to work cleaning up the wet lab in preparation for the major push on the cod survey. 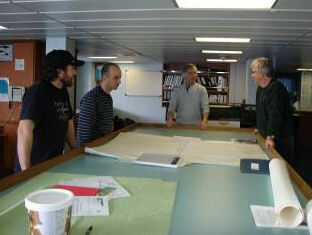 Surveys take a lot of planning. We took advantage of the down time to rethink how best to use the final 10 days of the survey to maximize coverage. For dinner tonight, we had a fine meal of Irish haddock – almost as good as ‘northern cod’ and cooked to perfection. 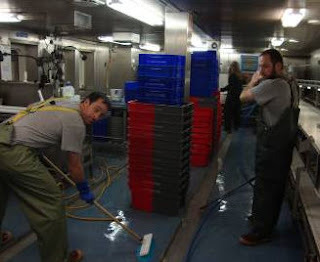 More about the hard working kitchen staff in a later blog – how important they are to life on the Celtic Explorer. Blog by Kate Barley and Dr. George Rose.